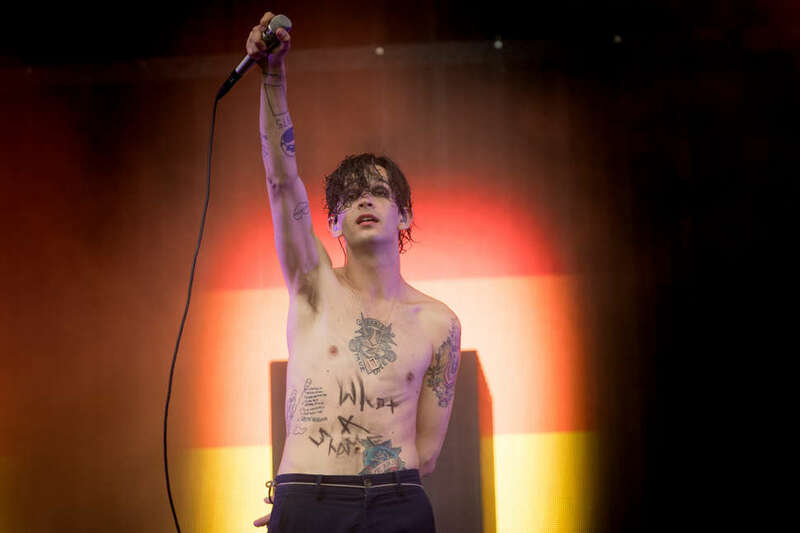 The anxiety of influence weighs heavily on Matty Healy, the rambunctious lead singer of English rock band The 1975. You can see it in the recently released video for the band's single "It's Not Living (If It's Not With You)," which finds the lanky 29-year-old sporting an oversized suit and performing in a style meant to imitate the Talking Heads concert film Stop Making Sense. You can sense it in his cheeky interviews and profiles, where he's prone to making proclamations like, "There are no big bands who are doing anything as interesting as us right now." The self-consciousness isn't a bug; it's a feature. It's the same type of go-for-broke, neurosis-soaked creativity that drives A Brief Inquiry Into Online Relationships, the group's recently released third record. Casual fans of the band, which has ballooned in popularity since the release of its self-titled debut in 2013, might've guessed the new album would be a relatively straightforward confessional about the perils of addiction. Towards the end of 2017, Healy checked into rehab in Barbados and kicked a heroin habit, which he told Rolling Stone didn't grow out of outlandish rock star partying. Instead, it emerged from the "polarity between connecting with 10,000 people and then going to a hotel room by myself." But Healy, who co-produced the whole record with band's drummer George Daniel, doesn't do simple. A Brief Inquiry, which is anything but brief with 15 songs clocking in just under an hour, mashes together big picture themes with the same glee it takes in combining genres. To the uninitiated, the record, which pings between '80s electro-pop and Drake-esque R&B, can sound chaotic or garish. Plus, given the amount of critical acclaim already heaped on the record -- it scored an 89 on MetaCritic, received the Best New Music distinction from Pitchfork, and will likely pop up on countless year-end lists -- a backlash and subsequent backlash-to-the-backlash feels inevitable. The group's previous record -- the one with the long title: I Like It When You Sleep, for You Are So Beautiful yet So Unaware of It -- debuted at the top of the Billboard Album chart in 2016, and this new one will likely do the same. Unsurprisingly, the algorithms that rule streaming services like Spotify have consistently rewarded the group. (In a bit of curatorial synergy, Healy also runs a playlist called "Faded Splendour" on Spotify that includes canonical indie acts like Ride, New Order, Mineral, Teenage Fanclub, Guided by Voices, and Yo La Tengo.) Though Healy and his bandmates might seem like a group of cyborgs sent to Earth to write songs that mix Blur-like Britpop with Top 40 radio trends, the album is more than a checklist of tasteful musical references and contemporary buzzwords. The record's blend of irony and earnestness is best personified by the single "Love It If We Made It," a track that turns the tumult of your social media feed into an post-apocalyptic death drive with Healy behind the wheel. "Jesus save us/Modernity has failed us," he cries out in between lines about Lil Peep and Donald Trump. Instead of cruising through red dust tornados out of Mad Max: Fury Road, the song's synths brings to mind the cotton-candy digital landscapes of Mario Kart. One minute you're flying down Rainbow Road; the next you're in the fiery depths of Bowser's Castle. Even on the ballads, like the jazzy "Mine," Healy doesn't hit the breaks. An emo kid with unapologetic Bono-like rock star aspirations, Healy is interested in extremes, and A Brief Inquiry into Online Relationships is always pushing the limits of its own form. Sometimes that means testing the listener's patience. A track like the garage-inflected "How To Draw / Petrichor" finds the group almost completely untethered from pop song structures that the singles traffic in and Healy's bratty vocals bathed in Auto-Tune effects. On the Radiohead-like parable "The Man Who Married a Robot," a Siri voice narrates a tale of tech-assisted alienation. "You can tell me anything" says the voice of "the internet." "I’m your best friend." As you'd expect, the band doesn't exactly think this is a healthy relationship. The album's analysis of our dystopian present will likely be relatable to its core audience: Healy's lyrics share the same quasi-deadpan affect and hopeless nihilism of an emoji-riddled, self-referential group text between friends. (Lines like "I found a grey hair in one of my zoots" would also make for decent away message fodder on AIM.) But he also pushes back against that same detached tendency on tracks like "Sincerity is Scary," which floats on horns and an R&B sing-along hook. "You try and mask your pain in the most postmodern way," he sings. "You lack substance when you say something like, 'Oh, what a shame. '/It's just a self-referential way that stops you having to be human." It's worth asking: Does A Brief Inquiry Into Online Relationships also lack substance? That argument will certainly be made, particularly now that the group has attracted so much positive press, but the best songs hold up to close scrutiny and repeat listens. (This isn't a splintering Greta Van Fleet situation.) Yes, The 1975 have a mawkish, treacly side that can feel disingenuous when paired with their more cerebral and trolling aspects, but their desire to tackle lofty ideas and entertain in equal measure powers the record. The ending of the "It's Not Living (If It's Not With You)" video points the band in a useful direction: Awakened from a dream and freed from his worries on stage, Healy takes the stage and shakes his limbs with hammy gusto. The air quotes remain to an extent but the commitment -- and the relationship between the performer and the audience -- is real.